Google has partnered up with an online charity to provide classrooms with low-cost Chromebooks for the holidays. From now through December 21, educators can request discounted Chromebooks through DonorsChoose.org, a Kickstarter-like charity that focuses on projects submitted by public schools. 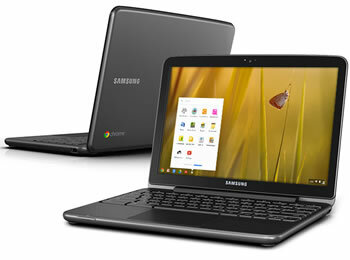 According to the promotion rules, teachers can apply for up to 30 Chromebooks, which are priced at only $99 each. This request is posted online where it may (or may not) be fulfilled by donors, just like Kickstarter. DonorsChoose has a FAQ page that provides a decent scope of how the service works. Although this is intended to be a charitable exchange, we imagine teachers could submit their requests and then fund their own projects, effectively purchasing their own devices. Google's $99 asking price includes management and support ($30 alone), while the Samsung Series 5 typically goes for $399. The Series 5 offers a 12.1-inch 1280x800 display, a dual-core 1.66GHz Intel Atom N570 processor, 2GB of RAM, a 16GB SSD (Chrome OS is largely cloud-based), a 4-in-1 memory card slot, dual-band Wi-Fi and optional 3G, a micro-VGA port with a VGA adapter, two USB 2.0 ports and up to 8.5 hours of run time. Although Chromebooks haven't exactly been a hit among consumers, Google notes that more than a thousand schools have adopted the systems, including three districts who have deployed thousands of Google's notebooks. They're a little light on horsepower, but Chromebooks are sufficient for basic tasks such as researching, word processing, building presentations and collaborating with others.